This ready-to-use PowerPoint is perfect for pastors, teachers, or personal study! 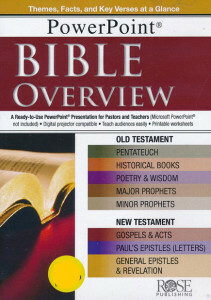 The Bible Overview PowerPoint presents a summary, outline and main themes of each book of the Bible, introduces different biblical literature (Law, History, Wisdom, Gospels, etcetera), lists of major and minor prophets, and much more. Over 100 slides are great for ages 12 and up!